2x cod fillets with tomato & rosemary sauce. Perfect for adult dining. No prep no fuss. Perfect bake bag. Eating in inspired by dining out. From whole fillet. Cook from frozen. High in protein. No artificial colours, flavours or preservatives.Birds Eye Inspirations bring you delicious, menu inspired dishes for quality meal time at home. Take our Cod fillets, in a tomato and rosemary sauce. Why not try them with a medley of beans, peas and crushed new potatoes? To Serve: Remove the bag from the oven/microwave, shake gently.Tear or cut the end of the bag with scissors.Be careful, bag and contents will be hot!Fish comes in all sorts of shapes and sizes, and so do ovens and microwaves, so while you'll always get a tasty fish dish the shape of fillet and sauce quantity may also vary.Please ensure food is cooked until piping hot.These instructions are guidelines only.Do Not refreeze after defrosting. Alternatively, Full Power: 1 bag, 650W/B 5 mins, 750W/D 4 1/2 mins, 850W/E 4 1/2 minsFull Power: 2 bags, 650W/B 9 mins, 750W/D 8 mins, 850W/E 8 minsStand for 1 minute. 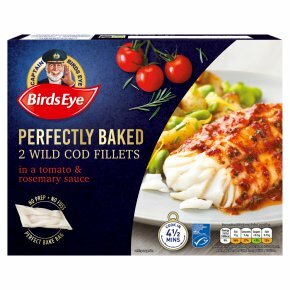 Tastiest when Oven Baked Straight from the Freezer.Pre-heat oven.190ºC, Fan 170ºC, Gas Mark 5, 30 minsPlace the bag containing the fish on a baking tray. Do not pierce the bag. Middle of oven.Two or more portions may require longer time.